The PocketBeagle is a tiny but powerful inexpensive key-fob-sized open source Linux computer. It has 44 digital I/O pins, 8 analog inputs, and supports multiple serial I/O protocols, making it very useful as a controller. In addition, its processor includes two 200-MHz microcontrollers that allow you to implement low-latency, real-time functions while still having the capabilities of a Linux system This article discusses my experience trying out different features of the PocketBeagle, along with some technical details. The PocketBeagle is a compact Linux computer, somewhat bigger than a quarter. 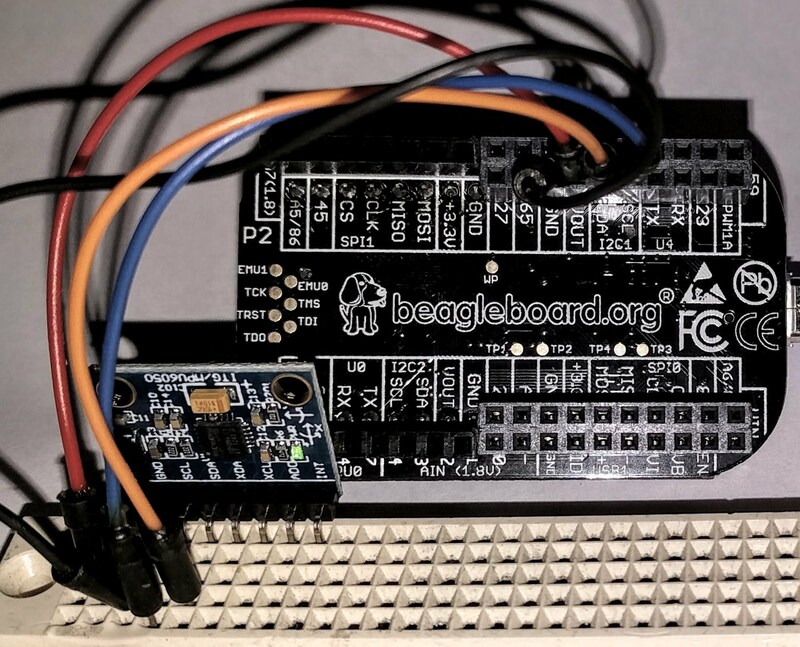 You may be familiar with the BeagleBone, a credit-card sized computer. The PocketBeagle is very similar to the BeagleBone, but smaller and cheaper. Both systems use TI's 1GHz "Sitara" ARM Cortex-A8 processor, but the PocketBeagle's I/O is stripped-down with 72 header pins compared to 92 on the BeagleBone. 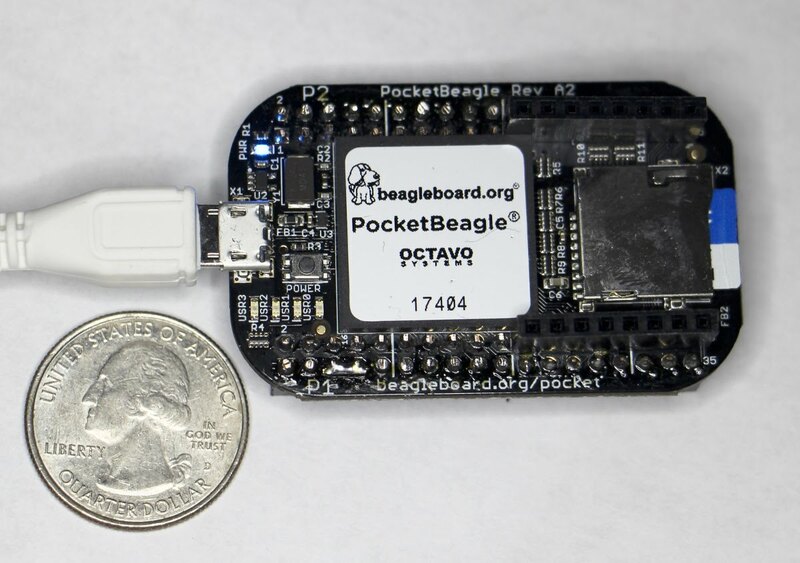 The PocketBeagle doesn't have the BeagleBone's 4GB on-board flash; all storage is on a micro-SD card. The BeagleBone's Ethernet and HDMI ports are also dropped. 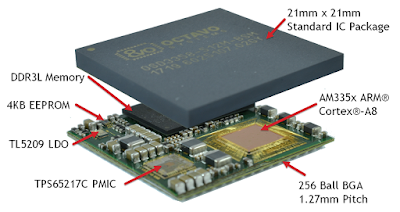 The PocketBeagle uses an interesting technology to achieve its compact size—it is built around a System-In-Package (SIP) device that has multiple dies and components in one package (see diagram below). 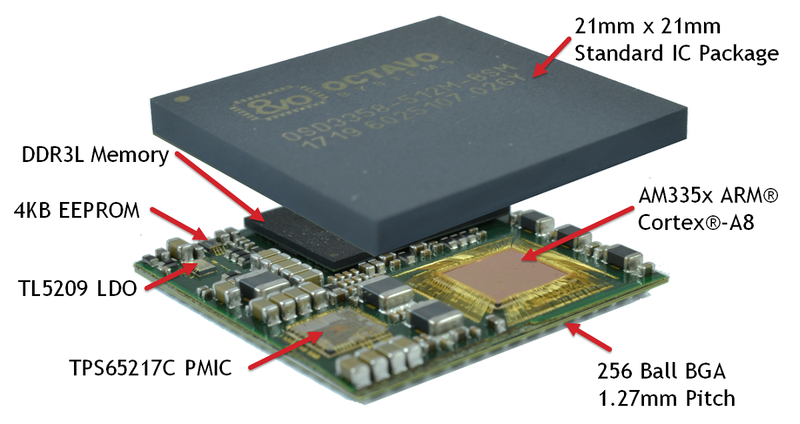 The Octavo Systems OSD3358-SM combines the TI 3358 Sitara processor, 512MB of RAM, power management and EEPROM. 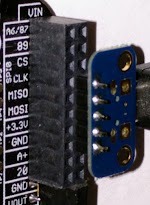 1 In the photo above, this package has a white label and dominates the circuit board. The PocketBeagle is powered by the OSD335x, which combines a processor die, memory and other components into a single package. You can also compile a kernel from scratch, set up U-boot, and build a file system on the SD card. the PocketBeagle. There's a bunch of information on this process at Digikey's PocketBeagle getting started page. This is the way to go if you want flexibility, but it's overkill if you just want to try out the PocketBeagle. Plugging a UART click board into the PocketBeagle gives access to the serial console. Accessing the PocketBeagle's serial console through an FTDI interface. Pinout diagram of the PocketBeagle's headers. USB=blue, Power=yellow, GPIO=white, PRU=cyan, SPI=orange, UART=brown, and other colors are miscellaneous. 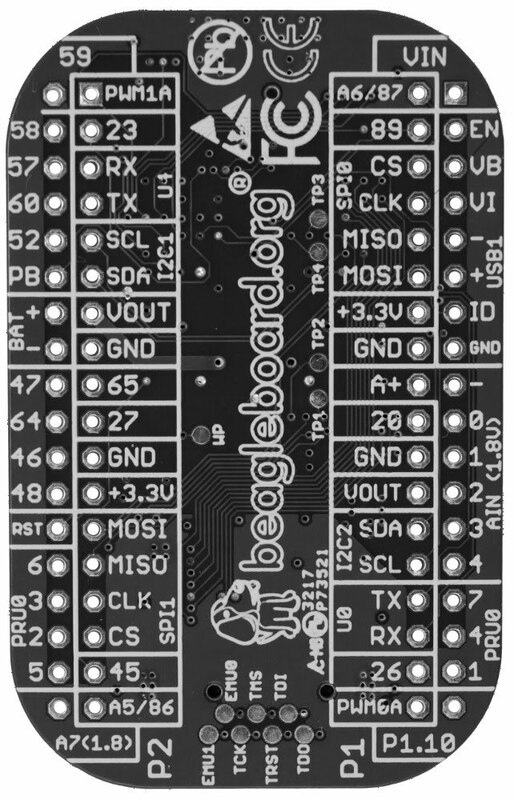 Note that the diagram shows the headers from the component side of the board, not the silkscreened side of the board. Comparing the pin diagram with the board (below), you will notice everything is flipped horizontally. E.g. GPIO 59 is on the right in the diagram and on the left below. So make sure you're using the right header! Silkscreen labeling the PocketBeagle's header pins. 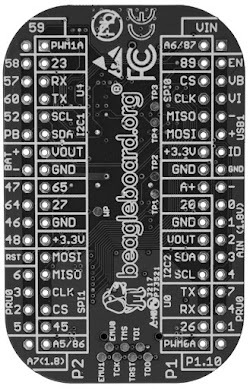 The PocketBeagle exposes 45 GPIO (general purpose I/O) pins on the headers. The pins can be easily controlled by writing to pseudo-files. For example, the following shell code repeatedly blinks an LED connected to GPIO 11110 (which is accessed through header pin P1_33). An LED connected to header P1 pin 33 can be controlled through GPIO 111. Although the PRUs are not as easy to use as an Arduino, they can be programmed in C, using the command line or Texas Instruments' CCS development environment. I've written about PRU programming in C before (link) and the underlying library framework (link) for the 3.8.13 kernel, but since then much has changed with the way the PRUs are accessed. The PRUs are now controlled through the remoteproc framework. In addition, a messaging library (RPMsg) makes it simpler to communicate between the PRUs and the ARM processor. A "resource_table.h" file provides setup information (such as the interrupts used). 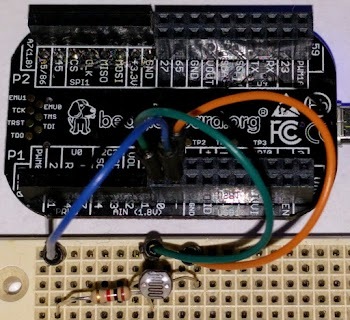 This LED example illustrates two key advantages of using the PRU versus controlling a GPIO pin from Linux.12 First, the PRU code can operate much faster. 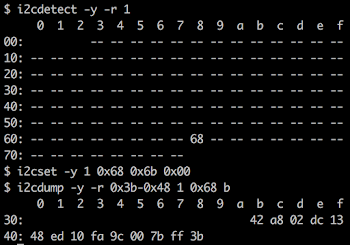 Second, the GPIO code will produce an uneven signal if the CPU is performing some other Linux task. 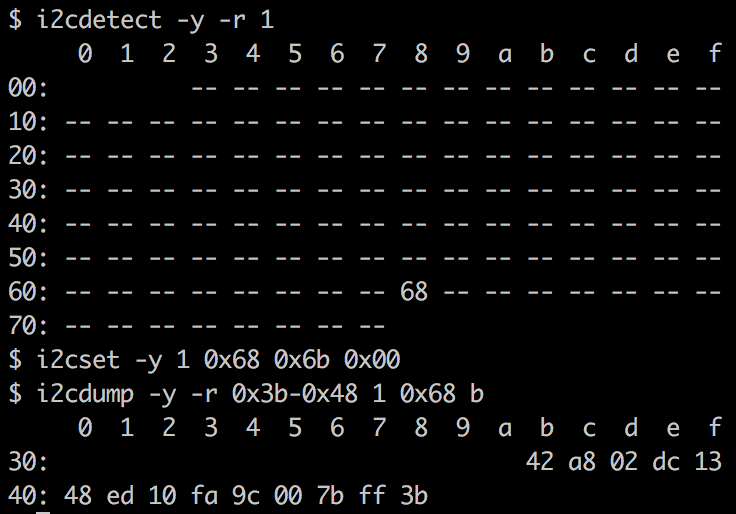 If you can handle milliseconds of interruption, controlling GPIO pins from Linux is fine. But if you need exact cycle-by-cycle accuracy, the PRU is the way to go. Unlike the BeagleBone, the PocketBeagle doesn't have a built-in Ethernet port. However, there are several options for connecting the PocketBeagle to the Internet, described in the PocketBeagle FAQ. I found the easiest was to use WiFi via a WiFi adapter plugged into USB, as shown below. An alternative is to share your host computer's Ethernet, which I found more difficult to get working.14 Finally, you can add an Ethernet interface to the PocketBeagle using the expansion headers. A USB WiFi adapter can easily be connected to the PocketBeagle. 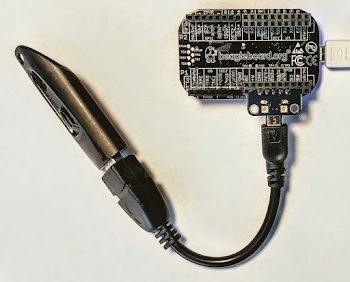 You can easily connect USB devices to the PocketBeagle since the PocketBeagle has pins assigned for a second USB port. Plug a USB Micro-B breakout board into the Pocket Beagle as shown below, connect a USB OTG host cable and your USB port should be ready to go. Note that this USB port is a host (i.e. a USB device is connected to the PocketBeagle) opposite from the onboard USB port which works as a client (the PocketBeagle is connected as a device to another computer). A closeup of how to plug the USB breakout board into the PocketBeagle. It is connected to pins P1_7 through P1_15. For instance, you can plug in a flash drive. (In the picture below, note that the flash drive is almost as big as the PocketBeagle.) The lsusb command will show your device, and then you can mount it with sudo mount /dev/sda1 /mnt. 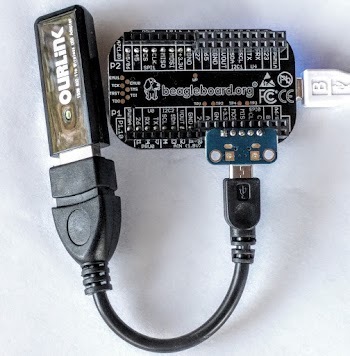 Connecting a USB device (flash drive) to the PocketBeagle. In the photo below, I hooked up a light sensor (CdS photocell in a voltage divider) to provide a voltage to analog input 0 (header pin P1_19). The reference voltages come from header pins P1_17 (analog ground) and P1_18 (analog reference 1.8V). More light on the sensor produces a higher voltage, yielding a higher value from the input. 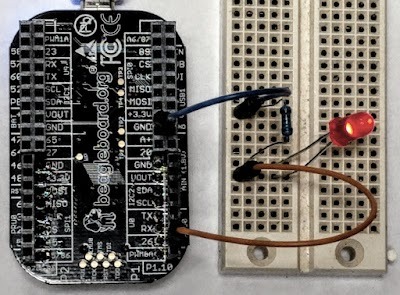 A photocell can be hooked up to the PocketBeagle's analog input to provide a light sensor. The PocketBeagle supports two SPI ports and two I2C ports. These serial protocols are popular for controlling chips and other devices. An accelerometer board (left) can be connected to the PocketBeagle's I2C port with four wires. 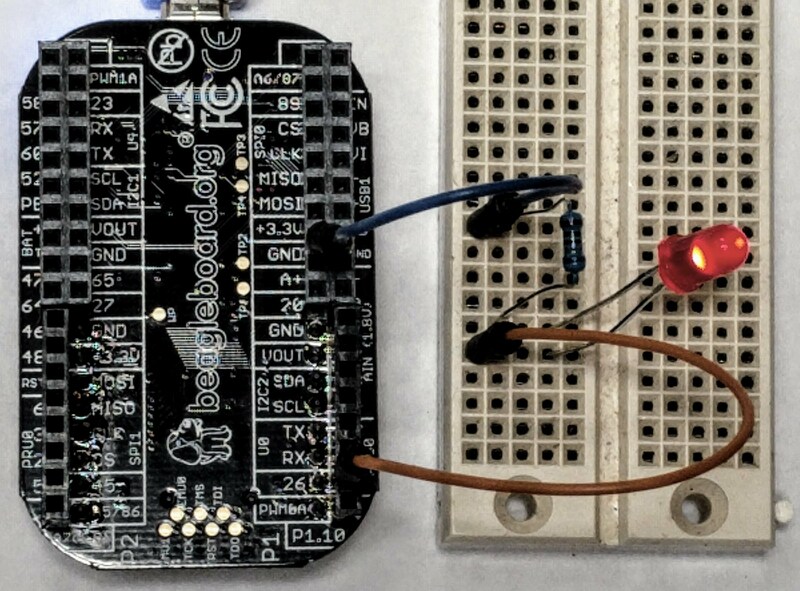 Using an I2C-based accelerometer board with the PocketBeagle. The PocketBeagle is a low-cost, compact Linux computer, able to control external devices with its I/O ports and GPIO pins. Since the PocketBeagle was released recently, there isn't a whole lot of documentation on it. Hopefully this article has shown you how to get started with the PocketBeagle and use some of its features. New (12/2017): The PocketBeagle System Reference Manual has lots of useful information, so take a look. For more information, see the PocketBeagle FAQ and Getting Started pages. 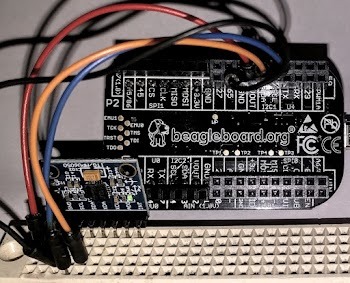 Also remember that the PocketBeagle uses the same processor and Linux kernel as the BeagleBone, so most of the information on the BeagleBone will carry over to the PocketBeagle. I've found the book Exploring BeagleBone to be especially helpful. Thanks to Robert Nelson and DigiKey for giving a PocketBeagle tutorial at Hackaday Superconference. The Octavo package reminds me a bit of the Solid Logic Technology (SLT) modules that IBM used in the 1960s instead of integrated circuits. They consisted of small metal packages containing semiconductor dies and resistors connected together on a ceramic wafer, and were used in computers such as the IBM 360. Two IBM SLT modules, with a penny for scale. Each module contains semiconductors (transistors or diodes) and printed resistors wired together, an alternative to integrated circuits. To switch P1_33 back to a GPIO, use config-pin P1_33 gpio. Analog input pins 5 and 6 are shared with a GPIO pin via a voltage divider. 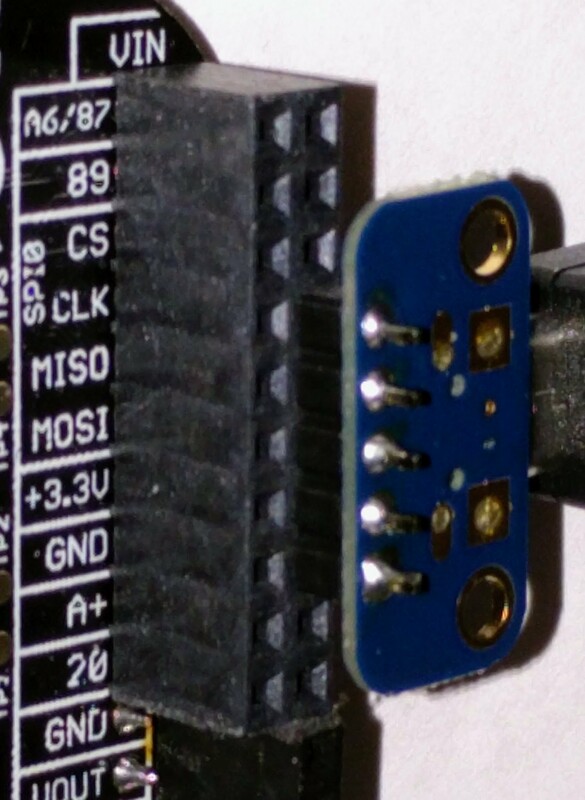 To use one of these inputs, you must configure the shared GPIO as an input with no pullup/down so it won't affect the analog value. In addition, the input voltage is divided by 2 (so these pins can support up to 3.3V instead of 1.8V). Thanks Ken, I always appreciate and value your expert opinion. I want to express my thanks as well. I just purchased a PocketBeagle and I'm finding this post to be an excellent practical help in getting started with it. I greatly appreciate your posting the references to the Sitara AM3358. I believe the URL for the reference manual should be http://www.ti.com/lit/ug/spruh73p/spruh73p.pdf rather than http://www.ti.com/lit/ug/spruh73n/spruh73n.pdf. Thanks, Paul. Apparently TI handles versioning for their documents by breaking all the old links. If you use this link http://www.ti.com/lit/pdf/SPRUH73 It will always give you the latest version. Is it possible to add RAM to the motherboard?. I' like having 4 GB motherboard RAM.